The prosecution on Monday questioned a former senior prosecutor who allegedly sexually assaulted a female junior colleague and used his power to demote her after she raised the issue. Ahn Tae-geun, 52, appeared at the Seoul Eastern District Prosecutors' Office at around 9:40 a.m.
"I will faithfully answer to the prosecution," he told reporters. Seo Ji-hyeon, a current district attorney, appeared on a cable TV news program last month and revealed that Ahn groped her during a funeral dinner in 2010. She also claimed he exerted influence to transfer her to a regional position in 2015 after she raised the issue with the prosecution's internal inspection office. Prosecutors are expected to interrogate Ahn over his role in the alleged unfair transfer. The statute of limitations has expired for the sexual assault allegations. 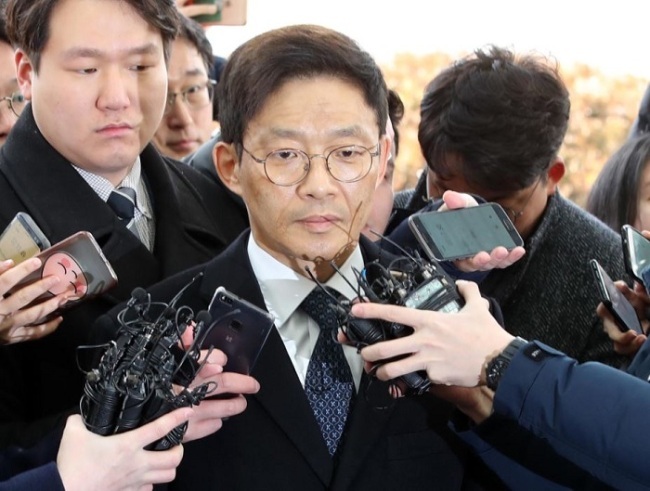 Ahn was dismissed in June last year from his position as the justice ministry director in charge of criminal affairs, after he offered cash to prosecutors investigating a corruption scandal involving former President Park Geun-hye. Ahn said he does not remember the incident with Seo because he was intoxicated at that time.